As I have previous discussed, multiple times, I have a penchant for somewhat ridiculous things. Whether it's fashion or home décor, I believe that everything in my life should be as fun and funny as possible. 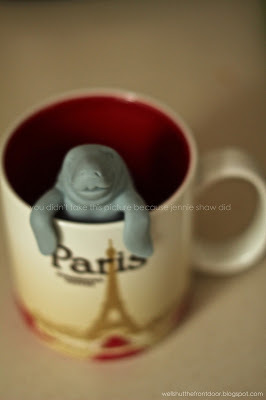 Yes, my lovelies, The Manatea (or Philip, as I call him) is not only a well-constructed tea ball, but also an animal AND a pun ALL AT ONCE, which triples his amazingness and I just about died from an awesomeness overload when I saw him on ModCloth. I mean, just look at Philip hanging out! He's hilarious! As soon as Philip arrived, I knew that I had made a solid purchase because he makes me smile whenever I see him, to the degree that I have decided to keep him in the front row of the cupboard so I can giggle every time I need a dish or cup because how can you not laugh when you see his cute little face and arms peeking out from atop whatever mug he's hanging out in? But for reals, Philip is the bomb and also reminds me a bit of a house hippo, which only makes me love him more because unlike the house hippo, Philip actually exists. So now I have an awesome way to drink my loose, Creamy Earl Grey tea, and I seriously couldn't be more psyched about it. Yay for fun things!! Ha! That's awesome! He's so cute! Oh he is the best! I love how he hangs on the cup. So practical and adorable at the same time - love that! What is a tea ball? oh my, I need Philip in my life....he is just too cute!! Phillip is amazing! If I were a tea drinker, I would require him in my house! He reminds me of the hedgehog toothpick holder I saw in a Real Simple magazine...A hedgehog toothpick holder that I must find a way to acquire!